2 to 12 cup Model 122 Farberware special edition all stainless steel with ready light, styled pour spout and handle. A real beauty with great style. They made these from the 1950's to the 1960's but not very many. They were an expensive upscale model using the patented heater/pump but styled so much nicer than the everyday model 142. From what I can tell this one was made in the late 1950's. It has a ceramic stem insulator and all SS parts. They still used "S.W. Farber" on the bottom plate. Super fast like all the Farberware pots. 1000 watts, fully automatic and really efficient. The stainless steel shell is electropolished on the outside for a brilliant shine. The pump, basket and diffuser are also electropolished making them easy to use and clean. The light comes on when the perk is done and the warmer keeps it hot until you unplug it. 1 minute per cup. One of the best coffee percolators ever made. All SS parts and body, easy to care for and easy to use. Made in NY, the Bronx. The ceramic sleeve around the stem is not held in place by the spring so it will come off for easy cleaning. Absolutely fantastic condition with new thermostat, light and warmer. Just like it came off the factory floor in New York. 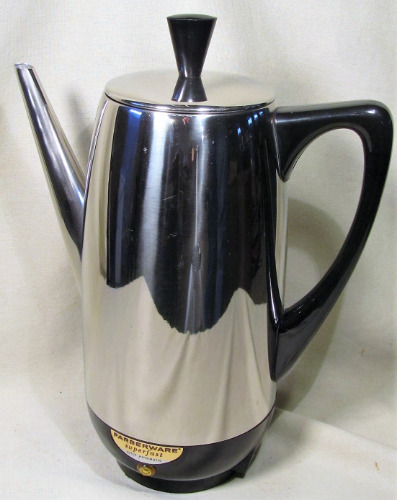 Farber is probably the Name that comes to mind when you think of percolators. And they probably sold as many if not more than any other manufacturer.Why? A simple, foolproof design that worked, and kept on working year after year.They got it right the first time and wisely left it alone Don't confuse these workhorses with the modern ones that are imported and burn out within 12 months... the originals that you buy at KitchenmadeUSA were built tough in the Bronx, nothing fancy, nothing to go wrong. These are easy to use, easy to clean, just easy all around. Maybe just the perfect all round percolator avaiable!